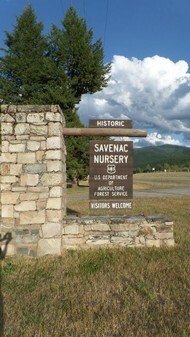 This year will mark the Savenac Nursery's 21st annual PIT project! No small feat, and not at all possible without the dedication of PIT volunteers, local support, and Superior Ranger District staff holding strong! We have had a pretty steady crew of "regulars" each year, but we are looking for new faces to add to our fun, so we welcome Savenac "vets" and folks new to our project to apply and join us this year! Once again, we will focus on giving Savenac its annual dose of TLC. Since 1995, we have been painting and scraping, working on the administrative buildings windows and wells; roofing, landscaping, replacing stairs, trail maintenance, museum displays, and building rustic furniture. This year, the long term and thoughtful maintenance will continue with plans for additional museum work and the potential for a bridge restoration project. There will be projects available for all skill levels. On Friday, July 15th, we intend to recognize the contributions made by all volunteers and staff who have helped make Savenac into the amazing project it has become. We will honor those who have joined us in the past, those who are present, and all of those who we hope to work with in the future. We believe we are a unique project, dear to many, and families have always been an important part of our project - we have watched many young people grow up through the numerous summers! We hope you will come and find out just what makes Savenac so special!